Happy 75th Birthday, Farmers Market! It's pretty early for a birthday party -- 8AM -- but then Farmers Market is a pretty early-morning kind of place. Well, that's not totally true; we've seen gabbing groups clustered around empty pitchers of beer way into the wee smalls, too. Pretty much if you like people watching, specialties from around the globe, history, boysenberry pie, quaintness, clam chowder, not spending tons of cash to have tons of fun, lingering at one table for however long you please, thank you very much, you like Farmers Market. Okay, so let's call it a fact: Farmers Market is an every-time-of-the-day, every-sort-of-eater-and-hanger-outer type of place. Done. On that we can all agree. And one of the most recognized meet-and-eat places in Los Angeles -- oh great googly-moogly, anywhere for that matter -- is marking its 75th anniversary with a whole week of special concerts, dining events, and a gargantuan cake. The cake is getting wheeled out the morning of Thursday, July 16th. 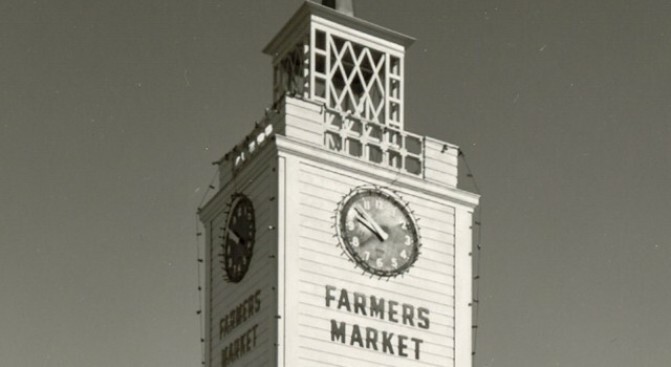 It's in the shape of the Farmers Market clocktower, which nearly makes us sprout freckles of happiness. And more: that witty Jeff Garlin of "Curb Your Enthusiasm" is the master of ceremonies. And the USC Marching Band is turning up to brassily wish the Market a happy 75th. Will there also be special guests reminiscing about the grand dame of Third & Fairfax? Indeed there will be.